Carnet de Voyage is the gorgeous sketchbook diary of these travels. From wandering around Paris and Barcelona between events, to navigating markets in Fez and fleeing tourist traps in Marrakesh, we see glimpses of each place, rendered in Thompson’s exquisite ink line. 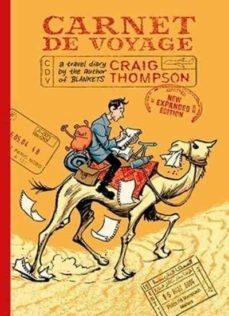 While desert landscapes and crowded street scenes flow, the sketchbook is packed first and foremost with people – other travelers passing through, friends and lovers he meets along the way and old friends and other cartoonists that weave in and out of Thompson’s life.